Venezuela: The referendum defeat – What does it mean? At about 1am, after a long delay, the Venezuelan National Electoral Commission announced the results of the referendum on constitutional reform. The proposals for constitutional change were defeated by the narrowest of margins, with 4,504,354 votes against, (50.70%) and 4,379,392, (49.29%) for the YES. Soon afterwards, president Chávez was on the television accepting the results. He said that the proposed reforms had not been approved “for now”, but that he would continue to struggle to build socialism. The result, as could be expected, was greeted with jubilation by the right wing opposition and all the reactionary forces. For the first time in almost a decade they have secured a victory. There were scenes of jubilation in the well-off middle class areas of Caracas. “At last we have shown that Chavez can be defeated! At last the slide towards communism has been stopped! At last we have given the rabble a lesson!”The joy of the reactionaries is both premature and exaggerated. A glance at the results shows that the voting strength of the opposition has barely increased. If you compare these results (after 88% of the votes had been counted) with the 2006 presidential elections, the opposition has only increased about 100,000 votes, but Chávez lost 2.8 million. These votes did not go to the opposition but rather to abstention. This means that support for the counter-revolution has not significantly increased from its highest point one year ago. A whole number of factors contributed to this result. The bourgeoisie have in their hands powerful instruments for shaping public opinion. They organised a full mobilisation of the reactionary media in a hysterical campaign of lies and slander against Chavez, the Revolution and socialism. This scare-mongering campaign of the reactionary opposition undoubtedly had an effect on the more backward sections of the population. The pressure was relentless. The Catholic Church, led by the reactionary Episcopal Conference, preached from the pulpits against Chavez and “godless communism”. There was a two-page paid advertisement in Ultimas Noticias, one of the most widely read papers in Venezuela and the one that most Bolivarians read, amongst other things, claimed that the State would take your children away from you and they would belong to the State and that freedom of religion would be abolished. In Carabobo, the regional newspaper Notitarde published a polling day front page headline that said, “Today you decide and it will be a decision forever” and just below a picture of an empty butcher’s shop with a Cuban flag and a picture of Castro with the headline “this is how socialist Cuba looks today”. All this exposes the mendacious hypocrisy of the campaign in the international media to the effect that “there is no press freedom in Venezuela today”. This noisy campaign reached a crescendo a few months ago when the government decided not to renew the license of RCTV, a right wing television station that was a notorious nest of counterrevolutionary conspirators who played a key role in the coup of April 2002. The problem is not that the Revolution has limited the democratic rights of the opposition and trampled on “press freedom”. The problem is that the Revolution has been far too generous with its opponents, far too tolerant, far too patient, far too gentlemanly. It has left too much power in the hands of the oligarchy and its agents. It has placed a weapon in their hands which they are using very effectively to sabotage the revolution, halt it in its tracks and ultimately destroy it. All this is true but it does not answer the question of why the “no” vote won. The main element in the equation was abstention: a large number of Chavistas did not bother to vote. The question must be asked: why did they not vote? The bureaucrats and middle class cynics will blame the masses for their alleged apathy. That is completely false. 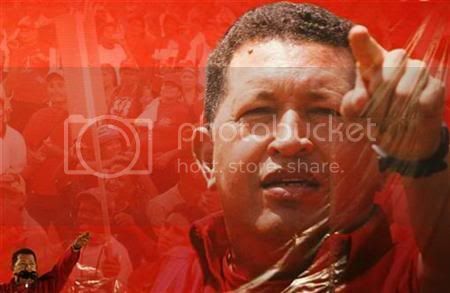 The masses have consistently voted for Chavez in every election and referendum. They voted massively last December. But now there are signs of tiredness. Why? After all the talk about socialism, the oligarchy is still firmly entrenched and uses its wealth and power to sabotage and undermine the Revolution. The golpistas of 2002 are still at liberty. The right wing media are free to spew out lies and slanders against the Revolution. Peasant activists are murdered and nothing is done about it. Jubilation by chavistas less than a year ago, after Chavez’s re-election for another 6-year term. Despite the reforms of the government, which have undoubtedly helped the poor and disadvantaged, the majority still live in poverty. The problem of homelessness remains unsolved. The sabotage of the landlords and capitalist is causing shortages of basic products. All this has an effect on the morale of the masses. The overwhelming majority of the masses still support Chavez and the Revolution, but there are clear symptoms of tiredness. After nine years of upheaval the masses are tired of words and speeches, parades and demonstrations, also of endless elections and referendums. They want less words and more decisive action: action against the landlords and capitalists, action against the corrupt governors and officials. Above all, they want action against the Fifth Column of right wing Chavistas who wear red shirts and talk of socialism of the XXI century but are opposed to real socialism and are sabotaging the revolution from within. Unless the Bolivarian Movement and the PSUV is purged of these reformist bureaucrats and careerists, nothing can be done. Anyone who reads these lines will immediately understand why there was no serious campaign. Ramón Martínez is not a socialist but a leader of Podemos, those renegades who split from the Bolivarian Movement on the eve of the referendum campaign in order to wage a violent campaign for the “no” vote. His conduct should surprise nobody. But it was not an isolated case. In Apure the governor did nothing to organize the campaign and many others behaved in a similar fashion. The bureaucrats merely repeated the same disastrous and empty campaign they organized one year ago in the Presidential election. A comrade in Mérida described it in this way: “It was a stupid campaign in which the posters only said that if you voted for Chávez it was out of “love”, while the campaign of the right wing was vicious. They said that everything would be taken away from people, that if you had two houses one was going to be taken away, if you had two cars, one was going to be taken away, that new-born children were going to be taken away by the “socialist” state”. After the result was announced there was a live phone-in show on RNV, one of the state radio stations, and most of the callers blamed the bureaucracy for the lack of campaigning for the YES. Many mentioned the attitude of “Chavista” governors and mayors who not only did not organise any campaign, but actively sabotaged it. These bureaucrats feared the passing of these reforms as much as the opposition did. They correctly saw that the masses would view this referendum as part of a long overdue settling of accounts not only with the ruling class, but also against the reformist and bureaucratic elements within the leadership of the Bolivarian movement. The declarations of the opposition after the result was announced were highly significant. The first speaker was one of the leaders of the reactionary students. In third place was Rosales, the opposition candidate for President who lost heavily to Chavez last December. But the second speaker was none other than General Baduel, the former Minister of Defence of whom we have written recently. Gen. Baduel—playing for time to make his move like Pinochet? What did Baduel say? He spoke of national reconciliation and offered to negotiate with Chavez. He renounced all intentions to organize a coup. In short he offered a smiling face and the hand of friendship. This is quite a clever tactic and confirms our impression of Baduel that he is a clever counterrevolutionary. This new tactic of the opposition also reflects the real balance of forces, which is, despite the referendum result, is still very unfavourable to the counterrevolutionaries. Chavez must act like a decisive—and well-armed—highwire artist. Tacking too much on either side may open the door to disaster. The Revolution should place no trust whatsoever in the smiling face of the Counterrevolution. Remember the words of Shakespeare: “there are daggers in men’s smiles”! The offer of reconciliation is a trap. There can be no reconciliation between Revolution and Counterrevolution because there can be no reconciliation between rich and poor, exploiters and exploited. The only reason for this change of tactic is that the opposition cannot defeat Chávez by direct action. They are too weak and they know it. The more stupid elements among the opposition are now drunk with success. But after a night of drunken euphoria will come a morning with a bad headache. The “victory” was won by the narrowest margin. The greatest exertions of the opposition only succeeded in mobilizing about 100,000 more votes. Moreover, this struggle cannot be won with votes alone. The pot-bellied bourgeois and his wife and children, the small shopkeeper, the student “spoilt brats of the rich”, the government clerks, resentful of the advances of the “rabble”, the pensioners nostalgic of the “good old days” of the Fourth Republic, the speculators, thieves and swindlers, the devout old ladies of both sexes manipulated by the reactionary hierarchy of the Church, the solid middle class citizens tired of “anarchy”: all these elements appear as a formidable force in electoral terms, but in the class struggle their weight is practically zero. The real balance of class forces was shown by the rallies at the end of the referendum campaign. As in December 2006, the opposition moved heaven and earth to mobilize its mass base and succeeded in assembling a large crowd. 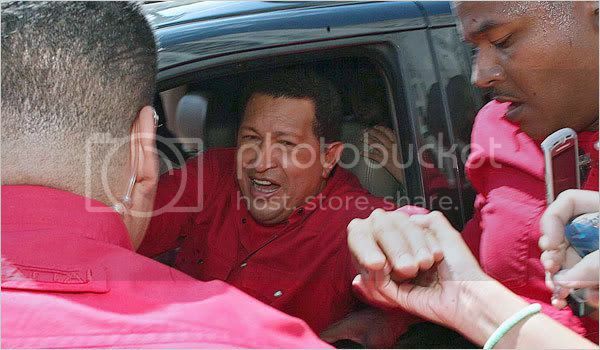 However, the next day the streets of central Caracas were flooded by a sea of red shirts and banners. The two rallies revealed that the active base of the Chavistas is five or eight times bigger than that of the opposition. The picture is even clearer when it comes to the youth. The right wing students are the storm troops of the opposition. They have been the main force organizing violent provocations against the Chavistas. They got 50,000 at their biggest rally, on the most optimistic estimate. But the Chavista students had 200,000 or 300,000 on their rally. In this decisive area of struggle – the youth – the active forces of the Revolution greatly outnumber those of the Counterrevolution. On the side of the Revolution stand the overwhelming majority of the workers and peasants. This is the decisive question! Not a light bulb shines, not a wheel turns, not a telephone rings without the permission of the working class. This is a colossal force once it is organized and mobilized for the socialist transformation of society. And the army? What about the army? Reformists like Heinz Dieterich are always harping on this theme like a repeating groove on an old gramophone record. Yes, the army is a decisive question. But the army always reflects the tendencies within society. The Venezuelan army has lived through almost a decade of revolutionary storm and stress. This has left its mark! There can be no doubt that the overwhelming majority of the ordinary soldiers, sons of workers and peasants, are loyal to Chavez and the Revolution. The same will be true of most of the sergeants and other non-commissioned officers and the junior officers. But the higher we go in the upper echelons the more unclear the situation becomes. In the last few weeks there were rumours of conspiracies and some officers were arrested. This is a serious warning! Among the officers, many will be loyal to Chavez; others will be sympathetic to the opposition or secret counterrevolutionaries. Most will probably be apolitical career soldiers, whose sympathies can incline one way or another depending on the general climate in society. 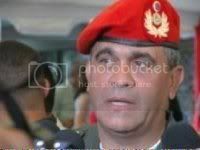 The fact that General Baduel has decided to adopt a cautious and conciliatory tone shows that there is no serious base for a coup at the present time. The serious counterrevolutionaries (including their CIA advisers) realise that the time is not yet ripe for an operation like that of April 2002. Why not? Because any attempt to launch a coup at this stage would bring the masses onto the streets ready to fight and die if necessary to defend the Revolution. Under such circumstances the Venezuelan army as it is at present would be a most unreliable instrument for a coup. It would lead to a civil war which the counterrevolutionaries would not be confident of winning. And who can doubt that this time a defeat of the counterrevolution in open struggle would mean the immediate liquidation of capitalism in Venezuela. It is for these practical considerations that Baduel is taking the position that he is taking. In effect he is playing for time, hoping that the objective conditions will change to the advantage of the counterrevolution and the disadvantage of the revolution. One must admit that these calculations are correct. Time is not on the side of the revolution! Baduel is now arguing for the convening of a constituent assembly. This is, ironically, the very same demand that is being put forward by the Argentinean PO and other ultra left sectarians. The ultra-lefts already found themselves agitating in the company of the Counterrevolution in the referendum campaign, so this should not be a great surprise. The role of Orlando Chirino and other so-called “Trotskyists” who called on people to spoil the ballot papers was absolutely pernicious. These ladies and gentlemen are so blinded by their hatred of Chavez that they are no longer capable of understanding the difference between revolution and counterrevolution. This writes them off entirely as a progressive force, let alone a revolutionary one. But let the dead bury their dead. The counterrevolutionaries and imperialists understand the situation far more clearly than the sectarian clowns and half-wits. The masses have been aroused to political life by Chavez and are fiercely loyal to him. The bourgeoisie have tried everything to remove Chavez but have failed. Each counterrevolutionary attempt has been shattered on the rock of the mass movement. They have therefore decided to arm themselves with patience and play a waiting game. Chavez has been elected for six years and therefore has five more years to run. The first step of the bourgeoisie was to ensure that he cannot stand for election after that. That was the importance of this referendum from their point of view. They calculate that if they can get rid of Chavez one way or the other the Movement will split in pieces and disintegrate, allowing them to take power back into their hands. It is an intelligent tactic, but there is a problem. Despite the referendum result, they are stuck with Chavez till 2012-13 and no other important elections are on the horizon. In a situation like Venezuela many things can happen in five years. That is why they want a constituent assembly. If they can win another referendum they will change the constitution to permit early elections which they hope they can win – probably with Baduel as their candidate. Why are they so confident they can win? Because the Revolution has not been carried out to the end: because important economic levers have been left in the hands of the bitterest enemies of the Revolution, and also because there is a limit to how much the masses can tolerate without falling into moods of apathy and despair. These observation today retain their full force. In his article dated Tuesday, 27 November 2007, Erik Demeester quoted figures from a recent report from Datanalisis (1) [the Venezuelan statistical service], which revealed what already many people knew: scarcity of basic foodstuffs is becoming intolerable. This study established that milk, beef and sugar have become very difficult to find. Other products like chicken, cooking oil, cheese, sardines and black beans are also very scarce. The analysts who compiled the report interviewed 800 people in some 60 different shops, supermarkets and markets, both in the private sector and the public distribution network, Mercal. 73.3% of the places visited had no milk powder for sale. 51.7% no longer had refined sugar, 40% had no cooking oil, and 26.7% no black beans, a basic staple in Venezuela. Two thirds of the shoppers declared that they experienced food scarcity to one degree or another in the shops where they usually buy. Queues of a few hours, sometimes up to four hours, to buy some milk are no longer the exception. As comrade Demeester points out, this is reminiscent of the situation in Chile when wholesale economic sabotage was used against the left-wing Popular Unity government of the 1970s. For the masses the question of socialism and revolution is not an abstract question but is very concrete indeed. The workers and peasants of Venezuela have been extraordinarily loyal to the Revolution. They have shown a high degree of revolutionary maturity and willingness to fight and make sacrifices. But if the situation drags on for too long without a decisive break, the masses will start to tire. Beginning with the most backward and most inert layers, a mood of apathy and scepticism will set in. If there is no clear end in sight, they will begin to say: we have heard all these speeches before, but nothing fundamental has changed. What is the point in demonstrating? What is the point in voting, if we live much the same as before? This is the biggest danger for the Revolution. When the reactionaries see that the revolutionary tide is ebbing they will pass over to the counteroffensive. The advanced elements of the workers will find themselves isolated. The masses will no longer respond to their appeals. When that moment arrives the counterrevolution will strike. Those who argue that the Revolution has gone too far too fast, that it is necessary to call a halt to the expropriations and reach a compromise with Baduel to save the Revolution are completely mistaken. The reason why a section of the masses are becoming disillusioned is not because the Revolution has gone too far too fast, but because it is too slow and has not gone far enough. The growing scarcity of basic products and inflation, affects mainly the working class areas, which are the basis of Chavismo. It is this that is undermining the Revolution, and not “going too far”. You cannot make half a revolution. If we accept the advice of reformists of the Heinz Dieterich school, we will surely destroy the Revolution. We would be acting like a man sitting on the branch of a tree and sawing the branch on which he is sitting. Marxists do not refuse to participate in elections. That is the position of anarchism, not Marxism. In general, the working class must utilise every democratic opening that is available to assemble its forces, to conquer one position after another from the class enemy and to prepare for the conquest of power. The electoral struggle has played an important role in Venezuela in uniting, organizing and mobilising the masses. But it has its limits. The class struggle cannot be reduced to abstract statistics or electoral arithmetic. Nor is the fate of a revolution determined by laws or constitutions. Revolutions are won or lost not in lawyer’s chambers or in parliamentary debates but on the streets, in the factories, in the villages and poor districts, in the schools and army barracks. We ignore this fact at our peril. The reformists believe that the working class must always observe the legal niceties. But long ago Cicero said: Salus populi suprema est lex (“The good of the People is the Supreme Law”. We might add: the Good of the Revolution is the Supreme Law. The counterrevolutionaries showed absolutely no respect for the law or the Constitution in 2002 and if they had succeeded they would have abolished the 1999 Constitution immediately. Yet now they are all shouting about the defence of that very same Constitution. Even after the defeat in the referendum, Chavez has enough powers to carry out the expropriation of the landlords, bankers and capitalists. He has control of the National Assembly and the support of the decisive sections of Venezuelan society. An enabling act to expropriate the land, banks and big private enterprises would provoke enthusiastic support among the masses. The level of abstentions that handed this narrow victory to the opposition is a warning. The masses are demanding decisive action not words! It may be that this defeat will have the opposite effect. It can rouse the masses to new levels of revolutionary struggle. Marx said the revolution needs the whip of counterrevolution. We have seen this more than once in the last nine years in Venezuela. You cannot make an omelette without breaking eggs and you cannot win a fight with one arm tied behind your back. A revolution is not a game of chess with clearly defined rules. It is a fight between mutually antagonistic and irreconcilable class interests. Decisive measures are necessary to defend the Revolution and disarm the Counterrevolution. * No retreat! No deals with the opposition! * Carry the Revolution forward! * Kick out the bureaucrats and careerists! * Arm the working people to fight against reaction! —Alan Woods is a well-known British Marxian analyst and activist who has spent considerable time studying and participating in the Bolivarian revolutionary process. He’s closely associated with the International Marxist Tendency. Posted in IDEOLOGICAL COMBAT, Latin America, THE LEFT & PSEUDO LEFT. Hi the article is amazing.